A clear vision brings focus and provides an anchor point for making bold strategic choices. It drives the search for new business models. As a rally cry, a clear and compelling vision provides direction in everything you and your colleagues do. Ask each other this question every day: does this action, activity, experiment, project get us closer to realizing our vision? If the answer is no, then don’t waste time, energy, and money on it. A vision is a compass that ensures your people and teams work on those things that matter to customers, clients, and other stakeholders. It will inspire, engage and activate people so they are able to do a better job. We learned there is a tool that helps you design how you add value with your business: the business model canvas. There is a tool that helps how you add value to your customers: the value proposition designer. 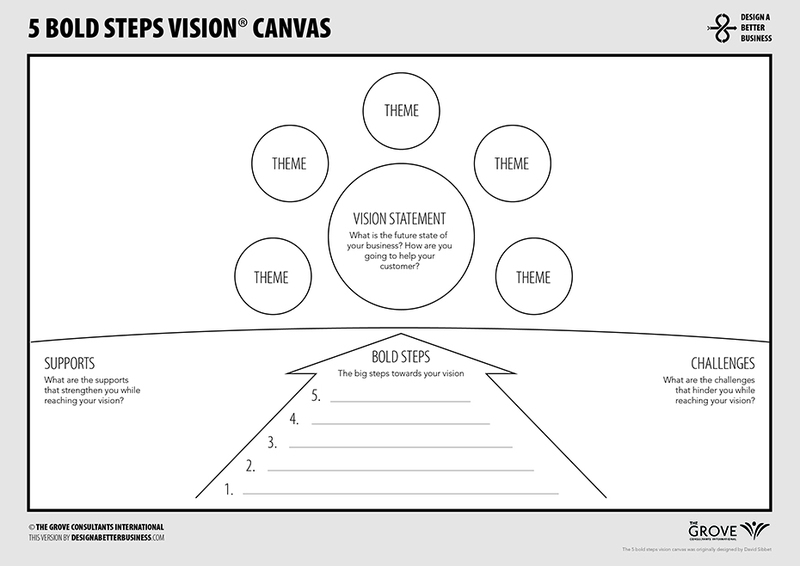 Now there is also a tool to understand your Point of View or design your Northstar: The Five Bold Steps Vision Canvas. If you want to make positive, future-oriented change in your organization you’ll need to go beyond writing long-winded paper visions and come to a shared agreement about what you are going to fight for together, and what steps you are go going to take to get “there”. The five bold steps canvas is a perfect tool to align your teams in your organization. A vision statement is the headline to a much richer story about your future. It is an anchor for the bigger story. While a vision statement is an aspirational description of what your team (or organization) would like to achieve or accomplish in the mid- or long-term future, to be truly useful (and powerful) a vision statement must point out not only where you want to go and when, but also how you’re going. The first step in vision design is about going beyond the vision statement. Yes, the vision should address the vision statement, the underlying themes and the examples where vision shows up. However, if the vision is meant to be a rally cry for the future, then it must be designed – or at least embodied – by the entire organization. To craft a vision that becomes your rallying cry, bring together a team and empower them to design the future. This is about pairing energy, fun, creativity, and ambition. To get started, dream big. Don’t worry about your daily job. Brainstorm with your team to visualize where you may see yourselves in the mid- and long-term future. Ask yourself what problems your team (or organization) hopes to solve in the next few years. What do you hope to achieve? Who is your target customer base, and what do you want to do for them? What will your future business model look like? A high-quality, practical and inspiring vision for any organization should have be concrete and clear. I must describe the themes that support the vision. So beyond the vision or rally cry, what are the essential themes in your vision? Is it about customer centric? About Quality? Or is it about Innovation? Mention 3 to 6 themes that support your vision. As you and your team begin to create the ideas of your future together, you’ll also need to capture the aspects of your organization, your strategy, and the broader steps that are necessary to achieve this vision. The key to capturing the supports for your vision is to ask yourself (and your team): “Why us? Why now/then?” What does your organization need to do to support your vision? STEP 5: TELL A STORY! When you enter that boardroom, or company strategy meeting, or VC pitch, what are you going to say? How will you sway people to your point of view, or at least convince them to explore with you? This is where stories make a big difference. Though naturally talented speakers may do this somewhat instinctively, anyone who does this well is deliberate about what stories they tell, how, when, and to whom. To make your mark and gain the buy-in you’ll need to explore your point of view. In other words, you’ll need to design your story. DON’T FORGET: DO IT TOGETHER! The process of designing the vision must take into account the values your organization lives by as well your realistic mid- and long-term goals. The vision you create with your company (or team) must outline the key objectives as well as high-level tactics and the elements of your business and values that support these. This will enable the various teams in your company to develop strategies to achieve the goals stated in the vision. With a single unifying vision, employees will all be on the same page and marching to the same drum. Your vision will become the North Star for the future. Landon Metz 1985 born Phoenix, USA Lives and works in New York, USA New York based artist Landon Metz (b. 1985, Phoenix, USA) is known for his subtle, evocative paintings composed of sparse biomorphic shapes. His work revolves around the activity of painting, yet also incorporates the vocabulary of sculpture, installation and performance. Metz’s work evokes a visual dynamism and sense of movement through his use of varying degrees of transparency and opacity, as well as compositional arrangements.